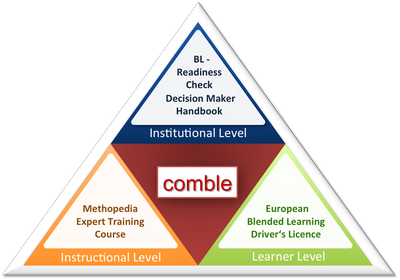 Methopedia is a product of the EU funded project Comble. The aim of the project is it to foster blended learning with collaborative components. Therefore three levels of educational institutions were focused: the management level, instructor level and the learner level. The introduction of collaborative learning activities and ICT based learning tools in seminars and trainings is just possible, when it is supported by the management of an educational institution, e.g. to get time (as a trainer) to develop learning materials, to get trainings and advices and to have time and opportunities to develop the methodological competence.